Uzu-no-michi is a speactacular 450m long promenade built into the supporting girders of the Onaruto Bridge, 1,629m, connecting Shikoku with Awaji island. 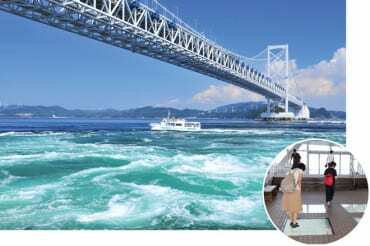 45 metres above the Naruto Strait, glass floor windows are situated every 100m along the walkway and allow visitors a prime viewpoint of a remarkable natural effect: the collision of strong currents and ebbing and flowing tides, at the meeting point of the Seto Inland Sea and the Pacific Ocean, which creates one of the three most ferocious tidal whirlpools in the world. This passageway was originally created to carry Shinkansen trains across the strait, but the plan was aborted due to engineering difficulties. Another ideal spot to admire the dramatic swirls on a clear day is Senjojiki observation deck, on a small public square next to the souvenir store Wakayama Shoten. The eddies are strongest during full moon and at low tide. 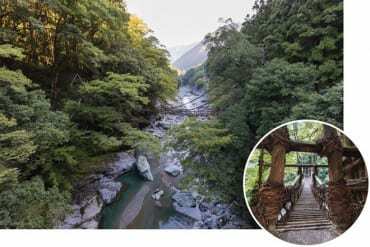 Deep in the heart of Shikoku, amid the mountains of western Tokushima, this remote, beautiful region found fame in the ’90s when US author Alex Kerr published a book, Lost Japan, on his experiences there. Hotel Iya Onsen’s cable car leads down a 170m incline to a 39°C outdoor onsen infused with natural hydrogen sulphide. Nearby, you can look down over “Hi-no-Ji”, a V-shaped geographical oddity reminiscent of Horseshoe Bend in Arizona. The hachigomu (mountain mist) floats over Oboke Gorge and the best known of the vine bridges crossing the Iya, Kazurabashi. This 45m long bridge may have been built as far back as the 12th century! Its swaying wooden slats don’t look reassuring (do wear sports shoes), but take comfort in the fact that the bridge is reinforced with steel cables, while the vines are replaced every three years. Spanning 2,775m across the dramatic hills leading up to Mt. 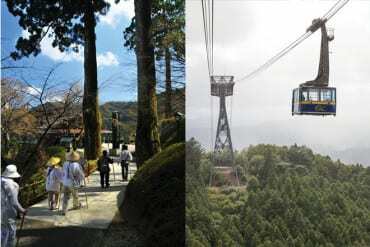 Shashin, Tairyuji Ropeway is western Japan’s longest cable car ride. 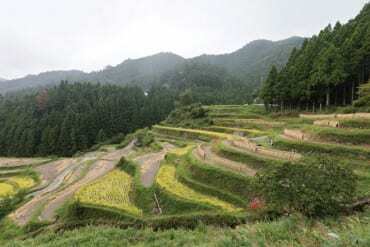 Opened in 1992, it leads to the 21st stop on the Shikoku pilgrimage circuit (Ohenro), which links 88 temples supposedly founded in the 9th century by Buddhist monk Kobo Daishi. Modern day pilgrims often make the trip in traditional costume. 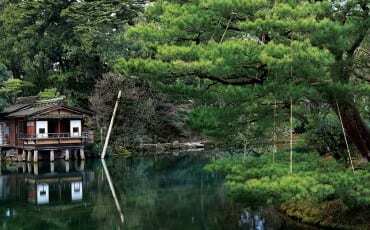 You’ll spot a bronze statue of Kobo Daishi perched perilously on a jagged peak, while Tairyuji temple is a dreamlike vision surrounded by cypress and cedar. Don’t miss the bell gate (Shoromon), hall (Hondo) and temple (Honbo). of the prefecture’s most scenic attractions. 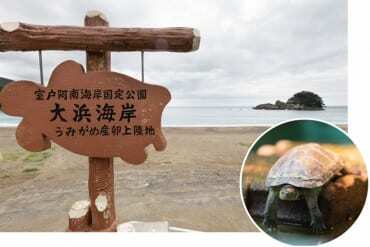 Every year from May to August, loggerhead sea turtles come to lay eggs on Ohama beach in Minami-cho, a town on the eastern coast of Tokushima. Back in the 1950s, when students came here and found that some had been eaten, they started to protect the animals by taking them back to school and raising them. Their efforts resulted in an ongoing conservation project and the opening of Caretta in 1985; among many other turtles of various species, the museum houses a grand old survivor of those early days that is now the longest living sea turtle in the world at 67 years. Ohama beach is also the starting point for a triathlon that takes place each July, and the final stop of a two-day harvest festival in October, in which residents from eight local neighbourhoods parade portable shrines on wheels, called chosa, and venture into the waves. Each of these weighs about a ton, and four children ride on top of each shrine while drumming a rhythm with taiko (percussion) instruments. This multi-use building in Tokushima city is the focal point for the best known cultural phenomenon to come out of the prefecture. Awa-odori is a folk dance that’s wildly popular here, as well as in the rest of Japan—it’s the best-known dance style in the country. 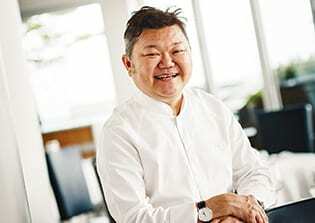 It differs substantially from other regional dances with its two-beat rhythm, freeform moves, colourful outfits and use of six traditional Japanese instruments. Visitors can watch uplifting demonstrations by dancers in the performance space—a studio at the back of the building—and the audience is encouraged to take part in the routines. Awaodori Kaikan is owned by the regional government, and if you want to see the dance there’s a charge of ¥1,000 per person—government funding also helps to subsidise the performance space. On the ground floor there’s an information centre and a large souvenir store that sells all kinds of edible, wearable and decorative specialities from the region.